We did a video or vlog recently about the difference between an analytical marketer and a creative marketer and thought it was worth touching more deeply on the analytics piece of data. Because the reality is, although data is so prolific today, not all data is equal and not all data is relevant. 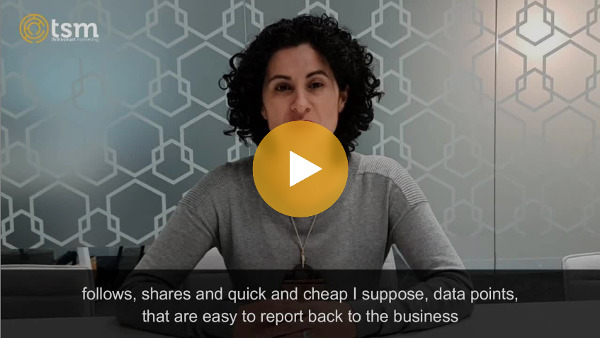 What’s really important, particularly as we are focused on building ROI or demonstrating ROI, is understanding what data points are relevant for our business. There’s always a big focus on what we call vanity metrics, thinks like likes, follows, shares and quick and cheap data points, that are easy to report back to the business. But they don’t actually tell us anything fundamentally about how effective our content is in terms of delivering business outcomes. And by business outcomes we generally mean sales or revenue or customer growth. So it’s important to get clear on what ROI means for your business, what data points the business is actually measuring and considers to be important. But also acknowledge that although vanity metrics aren’t the be all, end all, they are important because what they can do is help us optimise content. They help us understand a little bit more about what’s working, what’s not working and some of the changes and iterations we can make, to make our content more powerful. Then start thinking about how do we connect some of those data points then, that ultimately give us some level of confidence that our content programs are actually working and delivering that all important ROI number, which results in business outcomes and commercial outcomes. Hope that’s helped, if you have any questions on this topic, it comes up a lot, I’m very passionate about it, so please do put your questions in the comments, thanks.